Welcome to May's Meezer Musings - a little later than I'd intended, but here we are. Last month went by in a flash and it feels like only yesterday that I was sending out April's newsletter! So what's this month all about? The short delay has allowed me to include an important warning about a cat food products recall in the UK, which is our first item below. Did you know that there's such a thing as a National Siamese Cat Day? I didn't, but April 6th has been designated as such in the United States and I think it's a wonderful idea. A date for your diaries for next year! Over the years a number of people have asked me about the way Siamese cats' coats change color, especially when their Siamese cats turn paler in the summer months. I also discovered recently that the coats of hyperthyroid Siamese cats may turn paler, so there's a little discussion about that. I've been reading a couple of books about cats (and the way they interact with humans) that couldn't be more different to one another, so there's news of those, and we have our usual Meezer of the Month and Fun from Facebook features. For those of you in the UK and Europe there's an important message from Hill's about some of their Science Plan and Prescription Diet cat foods. Certain batches of these foods are being recalled due to an error in the ingredients - the faulty foods have been found to have high levels of iron, which can cause quite serious digestive upsets, so if you use Hill's cat food pouches, please check your supplies. You can find a list of all the affected products, and what to do above them, on Hill's UK website, or alternatively on their Facebook page. Hill's has confirmed that this only affects supplies in the UK, Ireland and other parts of Europe. Products in other areas of the world are not affected by this recall. April 6th is National Siamese Cat Day! A few weeks ago I discovered, sadly too late to include it in last month's newsletter, although I did manage to post it on our Facebook page, that April 6th is National Siamese Cat Day in the United States. I didn't know there was a special day for our Meezers, but I think it's a great idea - although I feel it should be an International Siamese Cat Day! It's all in the very good cause of raising awareness around the enormous number of Siamese cats who end up in shelters and rescues. You can read more about it in this article by the person who came up with the idea. So - a date for your diaries, and next year I'll send out a reminder before the day, so that we can all celebrate it together! In a Siamese group I belong to I recently noticed a comment about the coats of hyperthyroid Siamese becoming much lighter in cats with the disease. This makes sense, because the genes responsible for Siamese coat and point color are heat-sensitive; you often find that the coats of sick Siamese (those with infections and fevers, for example) will turn paler or, in the case of the points, become flecked with white in a salt-and-pepper effect. Hyperthyroidism, a disease in which too much thyroid hormone is produced, puts all the body systems into overdrive and speeds up the metabolism, potentially generating more heat, which in turn could theoretically make the coat whiter. I'd never come across this particular phenomenon before though. I did some research but couldn't find out very much about the color change. One heartening thing I did discover, though, in one of the reports I read is that Siamese and Himalayan cats are actually less prone to hyperthyroidism than other breeds. "Two genetically related cat breeds (ie, Siamese and Himalayan) were found to have diminished risk of developing hyperthyroidism" - from "Evaluation of environmental, nutritional, and host factors in cats with hyperthyroidism". The report goes on to say that factors such as canned cat food and the use of cat litter tend to increase hyperthyroidism in cats, which may explain why there seems to be a lot of it around these days. If you've ever had a hyperthyroid Siamese cat, I'd love to hear whether or not there was any noticeable color change in their points or coats. So when I shared the photo above from William Armstrong on our Facebook page it was understandably very popular! 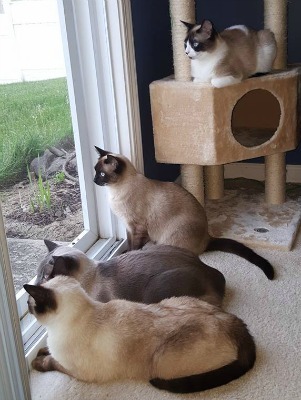 From top to bottom, meet Lalya, Lucky, Socs and Cappo, our Meezers of the Month for May, who live in Indianapolis with William. Socs and Cappo were William's first two cats, with Lalya and Lucky being rescued later on. Initially there was a fair bit of mistrust and some scuffles, but the four are now settling down together well and in this photo, have clearly spotted something exciting outside which has drawn their attention. Here's a short, fun video in the TEDEd series that I stumbled across recently. It's presented by Dr Tony Buffington, a cat behaviorist and Professor Emeritus of Veterinary Clinical Sciences at The Ohio State University College of Veterinary Medicine. With illustrations by cartoonist Chintis Lundgren, it includes lots of little gems on why cats do certain things, including sharpening their claws, hiding in small spaces and purring. Enjoy! Two very different 'cat behavior'-type books have crossed my path recently, and I thought you might like to know about them. The history, evolution and science that makes cats what they are. The first is Cat Sense by John Bradshaw, which I was given as a birthday gift a while back. It's a book you might enjoy if you've ever wondered about how and why domestic cats evolved from their wild ancestors. John Bradshaw is an English scientist who's been researching cats for thirty years, and mixes evolution, history, science, and his love of cats into a readable book that explores where cats come from, how they think and live, what makes them different to dogs and how they interact with humans. 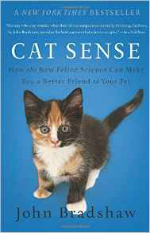 This is a scientific book and not a 'cat behavior' book in the usual sense - meaning that it won't necessarily make you a better cat parent, although you may understand your cats better because of it. Also, John Bradshaw lives in the UK, where many more cats are allowed outdoors than they are in some other parts of the world, so some parts of the book won't be relevant if you live, for example, in the United States. That said, I found it interesting. If you're thinking of buying it though, do read the reviews on Amazon first, as a few people said they found it extremely boring! Jackson Galaxy is known to many from Animal Planet's My Cat From Hell and his cat behavior books Catification and Catify to Satisfy. In Cat Daddy he tells his own story - how, from being a down and out drug-addicted rock musician (with the tattoos and dreadlocks to prove it) he turned into the behaviorist and Cat Whisperer he is today. This came about through his 13-year relationship with Benny, the equally down and out and damaged cat that changed his life. Benny was brought to the shelter where Jackson was working with a shattered pelvis; his owner couldn't afford the vet bills and didn't want him. At first, Jackson took Benny on as a foster, but somewhere along the way came to find that "Benny wasn't my foster cat anymore. He was my family." This book is primarily about Jackson Galaxy and his struggles, not about cats, and contains a fair amount of bad language. 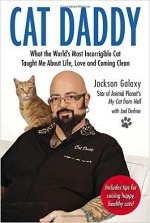 It's dark, funny, and very sad - but it might be for you if you've watched his shows and wondered just exactly what it is that makes Jackson Galaxy tick. 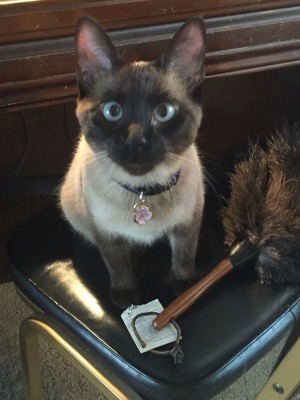 Our Fun from Facebook photo this month is of Donna Castele's girl Jazzmin, helping, in the way that only Siamese cats know how to 'help', to dust the piano. Donna said that the duster is Jazzmin's 'prey' most days. Thanks for sharing the photo with us, Donna! That's it from us for May - we'll be back again at the beginning of June. Have a great month in the mean time!